These are accurate uniforms for the crew of the RMS Titanic. They are not meant to be named crewmen but they are correct uniforms and ranks. Use with credits, if you're going to use them. No idea, but it looks nice. It occured to me when I tried to make a modern version of these uniforms. I thought a present-day WSL, as part of Cunard, would use the diamond instead of the curl to highlight its status a subsidiary, but I like to know the motives behind the difference. Wow!! You did amazing with these! The emblems on the hats are really good. I did have a nicer had badge detail but it was too big so I shrunk it down. That's why it's blurry a little. Thanks! Heh, sorry I suppose. The Captain is nowhere to be seen, like how he was nowhere to be seen on the bridge when the ship hit the iceberg. Apparently he jumped into the water and saved a baby or something once the ship's bow was underwater. 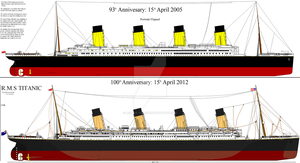 I listened to a video online showing Robert Ballard, the man who discovered the wreck of the Titanic. 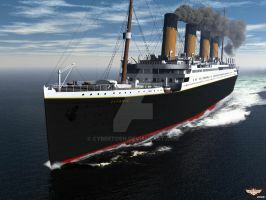 He says that contrary to myth that the ship was badly designed, the ship was designed just fine for a ship of those days, but the ship was no more designed for a direct collision with an iceberg than an airplane is designed for a collision with a mountain. He says that the captain was ultimately responsible for the sinking because of his negligence in refusing to slow the ship down while passing through an iceberg field. The captain is to blame I suppose, but I blame the moonless night and foggy weather. They couldn't see the iceberg until they could turn away from it just enough to graze it. Yes the environment of the surroundings was a factor, however if the Captain had of gone through slowly then the entire incident would have been avoided. He definitely should have done that given it was a moonless night with limited visibility. Well, the best thing about the Titanic was all of the liner changes afterwards. Number one there should be proper training for a full evacuation and enough lifeboats for everyone. Stupid Titanic ruining people's vacations by making them endure boring evac drills in crowded decks when they could well be at the restaurant or the theater having a good time. At least the musicians kept playing. Also the innocent iceberg was struck by the Titanic. Nobody ever thinks of that for some reason. Interesting. 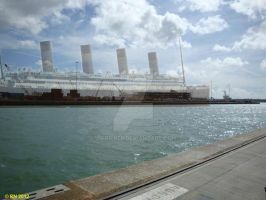 To be honest, I have not read almost anything about the aftermath of the Titanic's sinking. I know that Britain had a commission on the sinking, but have not thought to read about it. History to me is interesting to learn about, but the real kicker is when it's useful to relate to today. For the Titanic, it fits into both categories.